Documentary has been described as a “fiction (un)like any other” (2). In place of fiction’s access to ‘a world’, documentary claims to provide access to ‘the world’, a claim for special status, even moral superiority, in the direct bond formed between reality and its representation on film. Surrealist documentary both challenges and appropriates this claim for special status. Robert Flaherty staged scenes in order to preserve on film the vanishing way of life of the Eskimo (Inuit), seamlessly combining staged and unstaged footage in Nanook of the North (1922). 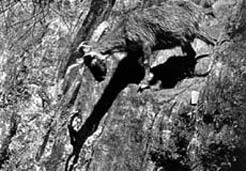 At the same time, Benjamin Christensen was jumping from one level of reality to another in Häxan: Witchcraft Through the Ages. 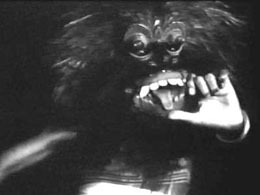 The narrative freedom with which Christensen combined fact and fiction in Häxan was something of a prototype for the Surrealist documentary. In aspiring to open the imagination upon reality, Surrealism blurs the distinction between fact and fiction. In Surrealist documentary and Surrealist films in general, the realistic effect is used to hook the viewer into the world represented by the film in order to disrupt taken-for-granted assumptions about that world (3). An open relationship between fact and fiction was brought into play in the use of footage from a documentary on scorpions in the first sequence of L’Âge d’or (Luis Buñuel, 1930) and in Jean Vigo’s mix of subjectivity, Kino-eye filming, satire and social survey in his portrait of Nice (À Propos de Nice, 1930). L’Âge d’or was first screened publicly 75 years ago at Studio 28 in Paris on 28 November 1930. 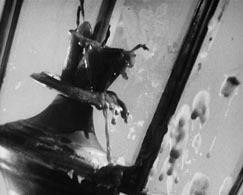 It brought a documentary edge to the Surrealist triptych culminating in the path-breaking ethnographic surrealism of Las Hurdes (Buñuel, 1933), which was both revolutionary and reactionary, ambiguous and unremitting, cruelly detached in the commentary and absurdly grandiose in the choice of background music. The opening up, in L’Âge d’or, of “the problematic of desire to a much larger social field” (4) through an unclassifiable, and quintessentially Surrealist, mix of genres – fiction and documentary, pseudo-history and melodrama – was more distancing and resistant to recuperation than the provocations of Un Chien Andalou (Buñuel, 1929) with its dreamlike images in “a psychoanalytic discourse of unconscious desire”. L’Âge d’or was subject to sustained attack from the Right and banned from public exhibition within a week of its release (a ban which effectively lasted for 50 years), while Un Chien Andalou enjoyed an eight months’ run in Paris, a success greeted with ambivalence in Surrealist circles. If Un Chien Andalou stands as the supreme record of Surrealism’s adventures into the realm of the unconscious, then L’Âge d’or is perhaps the most trenchant and implacable expression of its revolutionary intent. (5). The strategy of nimbly juxtaposing fiction with documentary footage was revived in W.R. – Misterije organizma (W.R.: Mysteries of the Organism, 1971) by Dusan Makavejev 41 years later in an essayist form David Thomson describes as “a leaping associative technique that goes from the human particular to the social and political pattern, and that also sees political behaviour as a response to psychological and sexual frustration” (6), a description that might equally be applied to L’Âge d’or. In a comparable mode, Chris Marker employed the strategy of combining ‘real’ images, a fictional narration and a journey structure in Sans Soleil (Sunless, 1983). He displaced the traditionally linear travelogue by synthesizing the real and the imaginary into an engagingly Surreal essayist mode comparable to that of Surrealist Patrick Keiller in his companion films, London (1994) and Robinson in Space (1997). In cinema, numerous contradictory discourses are framed by a dominant discourse that functions as a metalanguage. In the case of documentaries, this is usually a voice-over commentary binding together the various versions of reality proposed by images and other voices. (12) In Surrealist documentary, commentary is either absent, sparse or stripped of its dominance, becoming more of a dissonant or contrapuntal voice. In comparison with the strategies of deconstruction and of juxtaposition referred to above, observational objectivity is transmuted by Jean Rouch’s crisscrossing of “the boundaries between documentary and fiction, observer and participant” (15). The linking of bizarre and exotic cult ritual with daily experience in Les Maître fous (The Crazy Masters, 1955), which Rouch claimed to be therapeutic for the participants (16), is extended to the conscious mingling of fiction and reality in Moi un Noir (1958). 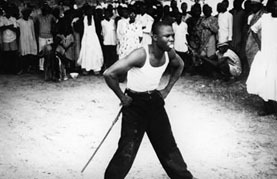 In what he called a psychodrama, Rouch invited Africans to improvise a narration to a rough-cut of the silent footage of his film, thus controversially giving indigenous subjects a creative voice in an ethnographic film for the first time. Rouch acknowledged the influence, on Moi un Noir, of Buñuel’s portrayal of “desperation and despair” in Los Olvidados (1950). (17) He claimed that “fiction is the only way to penetrate reality”, a strategy he deployed in his subsequent ethnographic fictions. He described Jaguar (Rouch, 1967) as “a postcard in the services of the imaginary […] like a Surrealist painting […] using the realest possible products of reproduction […] in the service of the unreal, putting them in the presence of irrational elements” (18). After Chronique d’un été (1961), Rouch abandoned his path-breaking psychodramas, that he felt were too damaging to the people involved. He shifted his focus to the trancelike state he experienced as camera operator in the series of Sigui films, most notably in Tourou et Bitti (filmed in 1967), a feeling of profound communion with the people in and around the camera’s eye. Rouch called this feeling, which came close to that of possession, “cine-trance” (19). Such communion would seem to have been shared by Les Blank in his films on regional music, such as Always for Pleasure (1978), which captures the performative dynamic of participatory street theatre (the Mardi Gras and the activities of the Indian tribes in New Orleans), the participants frequently directly acknowledging the camera “that carries the charge of a magnificent fusion of work and play, aggression and sexuality, risk and joy” (20). Filipino Kidlat Tahimik reverses the entrancement of Rouch and Blank with other cultures through the camera lens by his portrayal, in Turumba (1981) and Mababangong bangungot (Perfumed Nightmare, 1977), of the encounter between traditional village life and a globalised Western culture in a surreal, hybridised world, “the viewpoint […] that of the other looking back at the West” with a sardonic even satirical eye (21). The affinity between filmmaker and subject in the fictional documentaries of Françoise Romand, such as Mix-Up ou Meli-Melo (1985) and Appelez-moi Madame (Call Me Madame, 1986), would seem to assume that of close collaboration more akin to the actor-director relationship, but evolved in the context of the subject’s life and personality with the words chosen by the subject. (22) Although sometimes accused of exploiting his subjects for his own æsthetic ends, Errol Morris, in films like Fast, Cheap & Out of Control (1997) and Mr. Death: The Rise and Fall of Fred A. Leuchter, Jr. (1999), has devised a technical device in order to maintain direct eye contact in dialogue with his subject as the camera is filming, thus breaking down the conventional journalistic observer status of much documentary filmmaking, or what he describes as “the difference between first person and third person” (23). The charge that can pass between filmmaker and subject through the camera – Rouch’s “cine-trance” – becomes an ecstatic engagement in films as apparently disparate as Die Grosse Ekstase des Bildschnitzers Stiener (The Great Ecstasy of the Woodcarver Steiner, 1974), with its invocation of the marvellous, and Song of Ceylon (1934), many of the images of which director Basil Wright described as being the result of impulse that seemed to come from his subconscious. (24) These films (and others such as Robert Gardner’s controversial, lyrical Forests of Bliss, 1986) (25) engage the potential of the photographic image for excess or what Roland Barthes called an ‘obtuse’ meaning that “appears to extend outside culture, knowledge, information” (26). While this may always be present in the photographic image, it is more pronounced in the cinema because, as David MacDougall points out, “it exists in contradiction to the regimes of meaning that are always more present in cinema” (27). 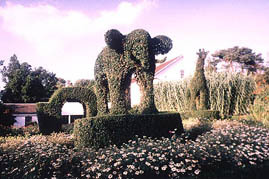 Although not theorized by the Surrealists in relation to the moving image, this excess can be been seen as an expression of the ‘marvellous’, the Surrealists’ equivalent of the (film) Impressionists’ photogénie – the transfiguring power of the photographic image which somehow exceeds artistic experience. But whereas the Impressionists were fascinated with what they saw as “the power of cinema to capture the mobility of a ‘transient reality’ [which] was particularly elicited by non-fiction films” (28), the Surrealists perceived cinema “as a kind of parallel universe that lay sunk in the folds of the real world” (29)] and was more likely to be found in the products of popular culture discovered by chance. This power of the cinema “to displace the visual subject from its pretension of control and self-control […,] the cause rather than the effect of vision” (30), can, however, be found equally in the products of popular cinema, or in the engagement with the real through the eye of the camera referred to above. An unusually close relationship between filmmaker and subject, but of a somewhat different order, is to be found in Crumb (Terry Zwigoff, 1994) and Alter Egos (Laurence Green, 2004). In the case of the former, not only had the filmmaker known his subject well for many years but he has confessed to sharing Charles Crumb’s admitted suicidal tendencies during the making of the film, giving “new meaning to the notion of art as therapy” (31), a mix of profound empathy and ambivalence also shared by the filmmaker and his two subjects in Alter Egos. Richard Myers’ portrait of Bill and Ruby (1970) and their relationships to the objects in their novelty shop in Akron, Ohio, is the expression of his special affection for them and “the strange, quiet simplicity of their world” (32). In Herzog’s La Soufrière (1977), the notion of filmmaker as participant is notched up a slot in an elemental drama of cosmic incongruities generated by a community’s response to the impending disaster of a volcanic eruption which finds parallels in Herzog’s film poems, Fata Morgana (1971) and Lektionen in Finsternis (Lessons of Darkness, 1992). A sense of incongruity is also generated by Peter Greenaway’s coolly ironic assemblages of near-death experiences (Act of God, 1980), seemingly random if often startling facts about the British coastline (The Coastline, 1983) and wry observations about some British bathrooms (Inside Rooms: 26 Bathrooms, London & Oxfordshire, 1985, 1985). Invocations of the real at the service of the idiosyncratic imagination is the thread drawing together, in a shared sense of obsession, the seeming polarities formed by Greenaway’s quizzical misanthropy and Federico Fellini’s affecting nostalgia (in I Clowns, 1971). Surrealist Jacques Brunius in Violons d’Ingres (1939) brought together portraits of a number of individuals – termed inspirés – whose obsessive ambitions led them to create objects to which society attaches no value, but which serve to externalise their inner worlds or what Breton called a “spectacular explosion of desire” (33). Brunius’ film thus seems to have an affinity with Errol Morris’ juxtaposing of four otherwise unconnected, self-confessed obsessives in Fast, Cheap & Out of Control, investing them with a strangeness through the dream-like effect of intercut found footage in which “fact gives way to fiction and life gives way to reflection” (34). Several Surreal documentaries have been made about the work of Surrealist painters. Henri Storck made two films on the Belgian Paul Delvaux. The 1947 film (Le Monde de Paul Delvaux), with music by André Souris and a Surrealist poem written and spoken by Paul Éluard, is described by Amos Vogel as “a disturbing magical experience” (35). In Storck’s 1971 film (Paul Delvaux ou Les Femmes Défendues), “a long walk with a lingering camera [… and] the poem and music [by Philippe Artuys] mimetically embody [the] dream figures.” (36) Raymond Borde collaborated with André Breton (who wrote the commentary) in “offering a bridge into the world of magic eroticism that [the artist] made his own” in Pierre Molinier (1964), which J. H. Matthews compares to Violons d’Ingres (37). Perhaps the documentary in which Surrealism was most openly proclaimed by its makers is L’Invention du Monde (1952), brought to light by Matthews. (38) In deliberate disregard of ethnographic classifications, Michel Zimbacca and Jean-Louis Bédouin combined images of artefacts from museums around the world with Aboriginal and Indian chants, Voodoo tom-toms, Bahian drums and music from Japan, Mexico and Bali. Their stated intention was to show how man “alters and recreates everything he chooses to represent”. Myths and symbols are expressions of “all the mind’s desires and interrogations”. The filmmakers saw their film’s essential Surrealism in the way the scenario was drawn, rather than written in a form of analogical play deployed by Surrealist poets, with a spoken text by one of their number, Benjamin Péret, explaining and interpreting the images in a form of free interplay between sound and image (39). Richard Combs suggests that perhaps Orson Welles saw no great difference between the fully-fabricated studio fantasy of Citizen Kane (1941) and the collection of selected documentary pieces at the centre of Vérités et Mensonges (F for Fake, 1974). (40) It may be that the synthesis of conscious and the subconscious that constitutes art is all we have to carry us beyond a reality which, Welles reminds us in F for Fake, is “ the toothbrush waiting at home in the glass, a bus ticket, a paycheck, and a grave”. According to Welles, every stage of Fake was infected by serendipity and chance prized by Surrealists. Towards the end of the labyrinthine chain of association between fiction and non-fiction that constitutes Welles’ play on documentary ‘truth’, he quotes Picasso to the effect that “art is a lie, a lie that makes us realize the truth” reminding us of the Surrealist belief that truth has little to do with what we conventionally think of as ‘real’. * At the time of publication it had not been possible to view these titles. Quoted in J. H. Matthews, Surrealism and Film (Ann Arbor: University of Michigan Press, 1971), p. 119. Bill Nichols, Representing Reality: Issues and Concepts in Documentary (Bloomington: Indiana University Press, 1991), p. 107. See introduction by Rudolf E. Kuenzli, Dada and Surrealist Film (New York: Willis Locker & Owens, 1987), p. 10. Linda Williams, Figures of Desire: A Theory and Analysis of Surrealist Film (Urbana: University of Illinois Press, 1981). Robert Short, The Age of Gold: Surrealist Cinema, Persistence of Vision, Vol. 3, 2002, p. 104. David Thomson, A Biographical Dictionary of the Cinema, revised edition (London: Secker & Warburg, 1980), p. 469. Sergei Eisenstein, Immoral Memories: An Autobiography (Boston: Houghton Mifflin, 1983, p.121. Luis Buñuel, My Last Sigh (New York: Vintage Books, 1984), p. 88. Yon Barna, Eisenstein (London: Secker & Warburg, 1973), p. 131. David Bordwell, The Cinema of Eisenstein (New Haven: Harvard University Press, 1993), p. 108. Letter quoted in Marylou Jennings (Ed. ), Humphrey Jennings: Film-maker, Painter, Poet (London: BFI, 1982), p. 22. Robert Lapsley and Michael Westlake, Film Theory: An Introduction (Manchester: Manchester University Press, 1989), p. 171. Jeffrey Ruoff, “An Ethnographic Surrealist Film: Luis Buñuel’s Land Without Bread”, Visual Anthropology Review, 14/1, Summer 1998. Also at Jeffrey Ruoff website. Paul Stoller, The Cinematic Griot: the Ethnography of Jean Rouch (Chicago: University of Chicago Press, 1992), p. 208. Mick Eaton, Anthropology-Reality-Cinema: The Films of Jean Rouch (London: BFI, 1979), p. 6. Jean Rouch, Cine-Ethnography (Minneapolis: University of Minnesota, 2003), p. 143. David MacDougall, Transcultural Cinema (Ewing: Princeton University Press, 1998), p. 110. Nancy Joy Peters, in Franklin Rosemount (Ed. ), Surrealism and Its Popular Accomplices (San Francisco: City Lights Books, 1980), p. 80. Martin Roberts, “The Self in the Other: Ethnographic Film, Surrealism, Politics”, Visual Anthropology Review, 8/1, 1996, p. 87. See Adam Hart, “An Interview With Françoise Romand”, Senses of Cinema, no. 35, April–June 2005. Interview with Errol Morris, Sony Pictures website. Cecile Starr, “Song of Ceylon: interview with Basil Wright”, Filmmakers Newsletter, November 1975, reprinted in Kevin Macdonald and Mark Cousins (Eds), Imagining Reality: The Faber Book of Documentary (London: Faber & Faber, 1996), p. 103. Roland Barthes quoted ibid, p. 72. Monica Dall’Asta, “Thinking About Cinema: First Waves”, in Michael Temple and Michael Witt (Eds), The French Cinema Book (London: BFI, 2004), p. 84. See “Richard Myers”, Canyon Cinema catalogue online. Jonathan Rosenbaum, “Fast, Cheap and Out of Control”, Chicago Reader online. Amos Vogel, Film as a Subversive Art (London: Weidenfeld & Nicholson, 1974), p. 67. “Paul Delvaux ou Les Femmes Défendues”, International Festival of Film on Art online. “Burning Masterworks From Kane to F for Fake”, Film Comment, January-February 1994.